There are two main reasons why we watch ultimate and sports in general: to be entertained, or to learn. Most everyone who watches ultimate has been consuming sports video for fun for much of their lives, but not everyone has a background with studying film. Whether it’s video of yourself, your opponents, or those playing at the highest levels of the game, there is a lot to be learned as a player from watching ultimate on film. But without proper focus and tactics, there is only so much you are likely to see. Here are six techniques to help you get the most out of your time watching film. This seems a bit silly at first; for most people, it is intuitive to follow the ball while watching sports like basketball, football, soccer, etc. In ultimate, keeping your focus trained on the disc can teach you some fundamentals around throwing technique and decision-making as a handler. But this volume of learning pales in comparison to what you can gain from watching the rest of the players. Try to shift your focus away from the disc and see how much more you notice: cutting progressions, spacing and crowding, defensive switches. All are important aspects of the game that good film shows really well. This technique does vary when watching different teams. For example, when watching Japanese teams or a group like Sockeye who like to use quick movement and dishy throws between handlers, much of the action does occur around the disc and you’d miss a lot by only focusing on cutters way downfield. On the flip side, just watching the handlers on a team like Chain Lightning that uses a lot of deep cuts and hucks will yield a pretty boring and non-educational experience as the handlers watch cuts develop and either huck deep or swing the disc. No matter what the playing style, when watched intently, every single point of ultimate is packed with valuable lessons on timing and setting up cuts, making space for teammates, positioning on defense, and cutting. Don’t miss them by limiting your focus to disc-watching. When you watch an open cutter comfortably catch a simple huck for a score, it’s easy to recognize “that was a good throw and decision.” Instead of leaving it at that and just continuing through the footage, take note of who caught the goal and rewind to a throw or two before the scoring pass and watch how that player moved and was able to get open. When and how did they set up the cut that beat their defender? What movement from teammates created the space to cut and throw into? How was the throw timed and shaped to attack the open space? Re-watch and learn what cutters do to be effective and score goals, what defenders do to position themselves to make a play on the disc, and what throwers do to deliver the disc where it needs to be when. Similarly, what about the movement, positioning, and actions of the cutters, throwers, and defenders led to a turnover? Take the lessons you learn from this and apply them to your own game. Similar to #2, ask yourself why some throws, cuts, or plays did or didn’t work, even if you already know the end result. Watching the disc, what do we see? Robbie Cahill throws an assist to Bart Watson. Cahill seems to throw a casual backhand huck to a cutter that, for some reason, doesn’t have a defender guarding the open side. Was it an amazing throw to a tight window that requires world-class talent? Did Watson utilize blazing speed to lose his mark? Why was he so open? If we watch the cutter (Watson), we see him make a sort of lackadaisical cut to the break side that is as much about clearing space in the middle of the field for his teammate as it is about actually attempting to cut for the disc. Then, recognizing that his defender has over-guarded that clearing cut, Watson turns back towards the deep space — in a classic Cutting Tree movement — catching his defender off-guard and unable to make up the space. Cahill, who was locked in on Watson while the rest of the U.S. offense was cleared to the far side to make space for Watson and/or Kittredge, sees that Watson has broken free into empty deep space, and throws a simple huck for a score. We don’t have to be ultimate savants to understand how players and teams are so effective; we just have to watch intently and ask questions about why things work or don’t. Despite some high profile exceptions, replay analysis and in-game commentary have come a long way in the last several years. We now have a widely respected and appreciated “voice of ultimate” in ESPN’s Evan Lepler. Lepler, a former player/captain, brings professionalism and increased entertainment value to the games he casts, and does well with explaining some basic information during replays for a broad audience. Some other commentators, however, tap into a deeper level of understanding and learning. Bryan Jones, Keith Raynor, and my favorite duo, Lou Burruss and Chase Sparling-Beckley, are all current or former coaches who have vast experience walking and talking people through strategy and tactics of ultimate. For example, here is the same clip we reviewed before, only this time, we are watching the full video with audio, allowing us to hear instant analysis from Burruss and Sparling-Beckley. Now, we have watched this clip a couple times, so we know what happens and why, but when watching these games for the first time, having a commentator — or if you’re lucky, two of them — that can immediately recognize the specific tactics and strategies that led to the end result and lay them out for you before the video replay even starts, you can save a lot of time and effort. 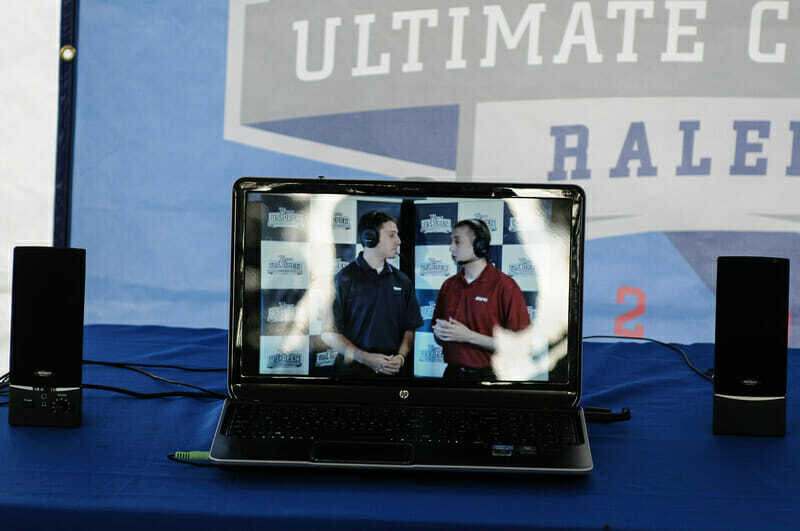 The 2012 World Ultimate Guts Championships games on NexGen Network, with Burruss and Sparling-Beckley on the call, are probably among the best games we have for this type of live analysis. While sometimes talking over each other and grinding through play-by-play calls, they both have an intimate knowledge of the game, understand what the other is explaining, and speak with the right mix of generic, approachable sports language and ultimate vocabulary to help paint a picture that players can learn from. Watching any random game on YouTube can yield some good learnings about some of the general strategies and tactics that can be employed at the team level, but there are a lot of techniques and mechanics that will go unnoticed when watching a full game. Basically, you miss all the little things that help you graduate from being one who generally understands ultimate to a well-rounded, complete player. A lot of these small details will emerge when you pick one player on a line and keep your focus trained on them for an entire point. More importantly, if you have a specific role carved out for yourself on your team — deep cutter, break-side cutter, primary handler, weak-side handler, handler defender, etc. — find a great player at the same position and watch them intently through entire points, games, seasons, and even careers. I’m a tall player that typically plays on the D-line guarding cutters and am often asked to play deep help defense. After watching a lot of games, I have gravitated towards studying Kevin “KK” Kelly of Chicago Machine, as I’ve noticed that whenever Machine’s opponents huck the disc, KK is usually in on the play, regardless of whether or not he was guarding the target. In watching him, I’ve learned more about when or when not to help deep, where to stay tight on my mark as opposed to providing a small cushion that keeps me in position to help if needed, how to time my help from the weak side to exploit and bait a deep throw, and more. There is a growing library of great footage out there for many of the top teams across all divisions and there is definitely a role model for everyone. If you don’t know who to follow, ask your more experienced teammates or coaches to point you in the right direction, or just watch a lot of film and see whose style appeals to you. Just like practicing and playing, watching film will help you improve each and every time you put in the work, and there is no cap to what you can learn. With each game comes the opportunity to see something new, or to see a particular strategy/technique from a new perspective. Even watching the same games two or three times can yield new results. Thankfully, there is plenty of high quality game footage easily available these days. The NexGen catalog alone can hold over even the biggest ultimate nerds for a long time to come, and the Ultiworld video store provides coverage of most major events since NexGen ceased operations. USA Ultimate has a library of games from their championship and other TCT events going back many years on YouTube, or you can find teaching-specific video content from providers like RISE UP Ultimate. Have any other techniques for watching film? Who are your favorite players and teams to watch to better learn the sport? Need help finding a role model? Let us know in the comments below. Comments on "Tuesday Tips: 6 Tips For Watching Ultimate To Learn"